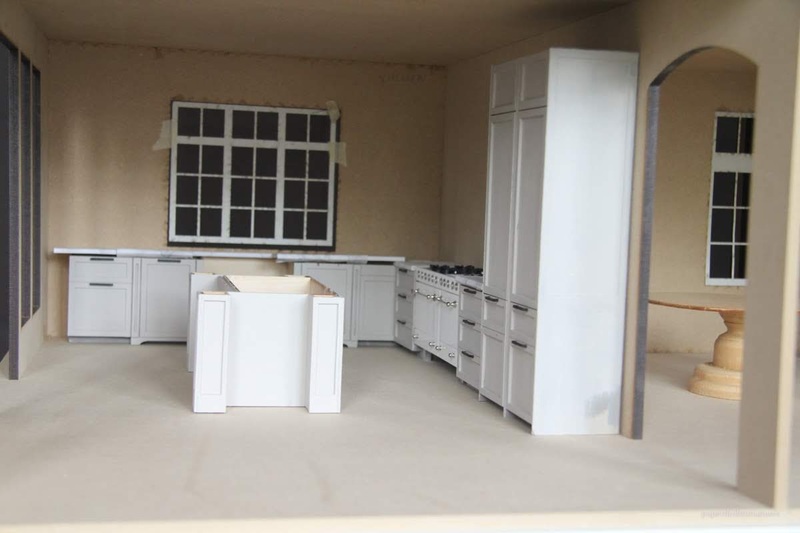 A little update on the dollhouse for you this weekend. It's been slow going because I (as usual) decided to re-cut everything to get the design right. (And I mean every single piece!) The house is a little wider now by about 3 inches to better fit the interior stairway and I replaced all the thinner mdf with 1/4 inch. The front porch and the chimney are new exterior additions. I'm almost tempted to put in another dormer on the third floor but I don't know exactly where it would go with the exterior design. I ran into some trouble cutting the 3rd floor supports. I couldn't find the jig that cuts angles on the table saw so I'm instead waiting for my next laser cutting slot. Every single wall in this house should be finished and properly cut (including the doorways and built-in bookcases) in the next two weeks! Yay! I'm happy with the way things are looking. I'm starting to figure out specific room layouts, plan out electrical, and find tile options. There are a couple of areas that will have hinges and I need to set those up too. I don't know what happened but Michaels really raised the prices of their basswood sheets this year. After some searching, I've found a couple more economical 1/16 plywood sheets to cut the windows with at a hobby shop. 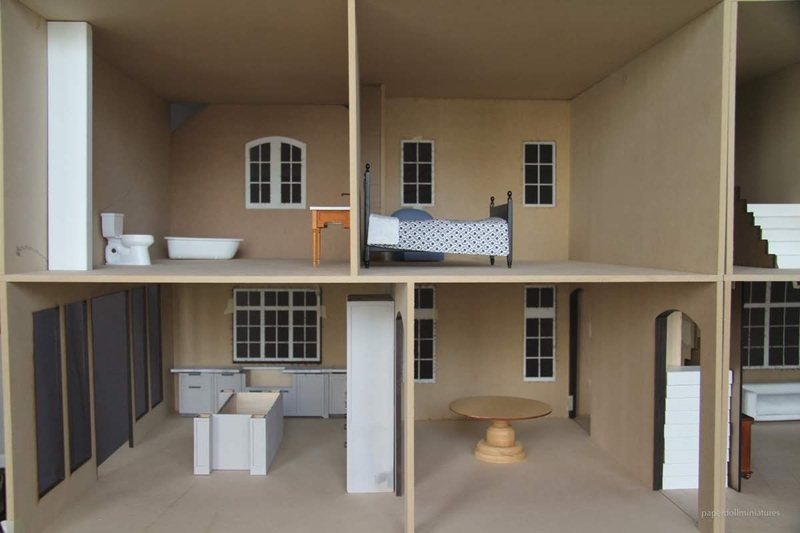 Another week or two and I'll start glueing parts of the dollhouse together. I get so nervous when the dog sneaks into that room! It's pretty solid right now but I get worried that one big bump to that table and the whole thing will come crashing down! It looks so good so far! Love your stairs. Depending on which walls are hinged, you could split the second floor bathroom in two and make a smaller ensuite with a walk in closet. Or just a really huge bathroom/dressing room with a vanity. The big windows of the empty space lend themselves nicely to an office. If that side wall is hinged you could slide laundry behind it? A narrow door at the back wall right next to the stairs to the third floor? For realism, if you have a second bathroom on the third floor it would go above the second floor bathroom. 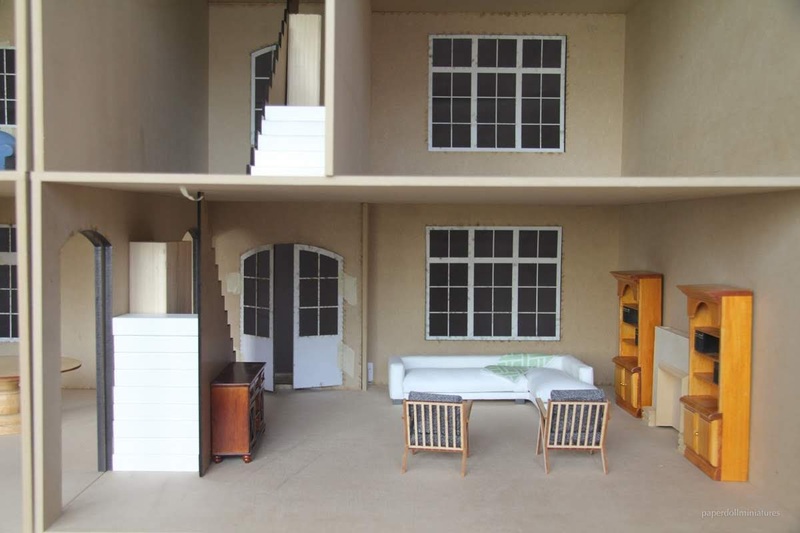 And you could make it a smaller room with a larger kids bedroom next to it, both with small dormers like the Houseworks one? With small four or six pane windows? I know what you mean about nerves. Every time a cat gets curious I feel like I'm holding my breath! Thanks for all the ideas Sheila! I was thinking of adding some sort of closet feature in that large bathroom on the second floor. I know it's kind of too large for just a bathroom but I really want two angles to look into the space, so maybe a set of double doors will do the trick. I'll definitely play around with your laundry idea. I think it will be easier now that I can see every space. I hadn't thought of the realism of having two bathrooms on top of each other! I was actually thinking I should avoid that... but it would make sense! I'm just not sure about the dormers? Would they look funny on the front? The chimney is kind of in the way. Would be nice from the inside though. So much to think about... Thanks! If you positioned two small dormers to be symmetrical on either side of the short gable you'd have something of interest on the roof and they wouldn't be too close to the chimney. Then you'd have light in the bathroom and bedroom potentially. Now there an idea! Thanks Shelia! This house is awesome! I so admire your work. 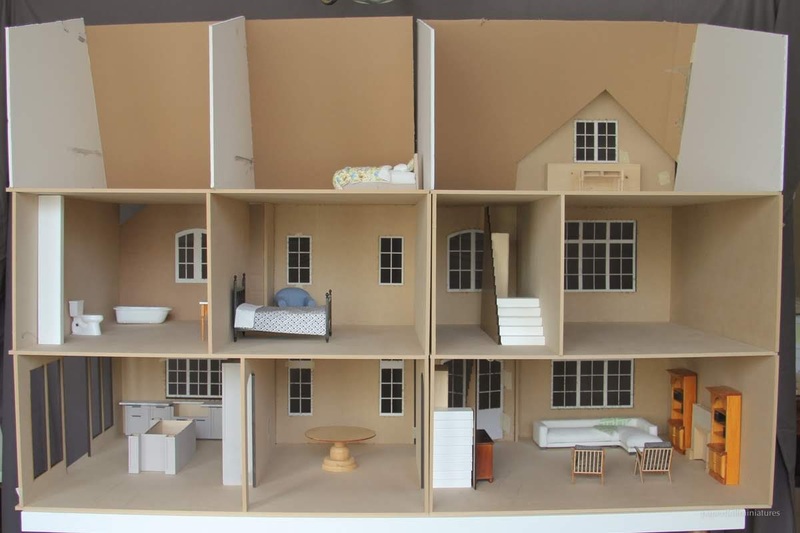 Making plans and building a large dollhouse from start to finish is an architect work. Thank you Drora! 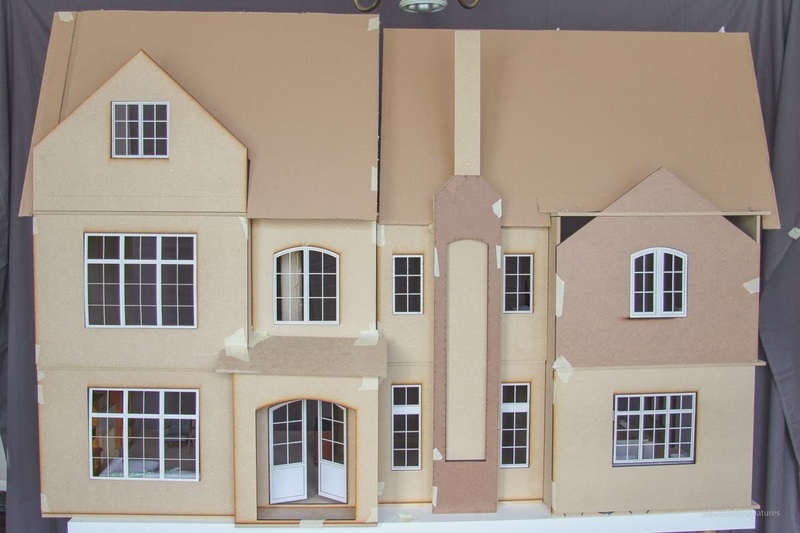 It's really an interesting thing... you use a lot of real house building concepts to make the structure, but at the same time some things just don't translate well into 1:12 scale and you have to find other methods. Es genial esta parte del diseño donde tienes que tomar montones de decisiones y pensar en como quedará mejor-La imaginación trabaja a un ritmo frenético. Casi demasiadas opciones, pero sí, es emocionante! Gracias por el aliento Isabel! It is so much fun to see this taking shape - thanks for the update post! The facade is looking great with the new porch addition and the chimney stack, and the extra room in the interior makes the entryway so spacious and inviting! 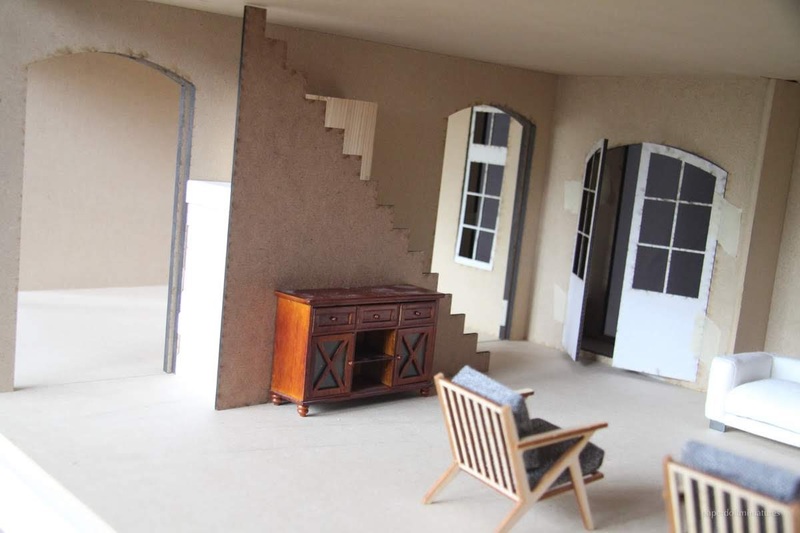 I know that whatever layout you decide on for the second and third floors will be brilliant - you just need some time, now that the walls are up, to let it marinate for a while. I hope you get to make the most out of your next laser cutting slots and that everything goes seemlessly! Que interesante ver como toda la casa va tomando forma,como se delimitan los espacios y la escala con los muebles se ve perfecta!! A mi me gusta un hermoso baño,donde puedas introducir algún mueble,bañera grande,hasta una zona de vestidor donde poder ponerse la ropa con comodidad después del baño. Me gusta mucho la estructura!!! Gracias Pilar! También me gusta un diseño de baño grande para jugar. ¡Creo que un vestidor sería genial! Great house! I love its structure and the front with its many windows. Thanks Marion, the chimney really is my favourite. I wish I could figure out how to add in another dormer in the third floor but I don't think the design will allow it. I know this house is going to be so much work and material! But I'm kind of happy I won't be building another structure for a while. I'm looking forward to spending time on the finishes and the decorating. I rushed through that last year in order to finish in time for the contest. I'm so amazed you are able to build a house a year! This is an classic looking house and should lend itself to all kinds of interesting room layouts! I do believe that you should be in business making custom kitchen kits for retail because single kitchen you make Kristine, I'm Bowled Over with! Your kitchen layout and the Fabulous window-wall are ideal for incorporating natural light, architectural interest and that desired long-view into the other rooms- I LOVE how they look! Hi Elizabeth! Thanks so much for the encouragement! I've been on the fence about selling my kitchens, I think I need to do another couple before I really get the design in a place to sell. They can be so delicate. I decided earlier this year to focus on building the house and I will only make things for sale or do tutorials as I make them for the house. I think it's hard for sellers to balance making inventory and actually enjoying working on their own projects. So we'll see how the year goes.